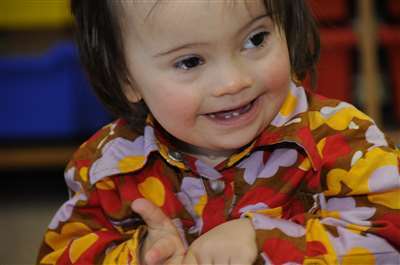 Parents of children and adults with Down syndrome have observed many of them engage in self-talk or 'private speech'. They may use self-talk to work out situations, express inner feelings, and entertain themselves. Some reports have stressed that this behavior is not a delusion or hallucination. The Self-Talk Survey was developed to investigate the quality, style, and content of self-talk. Surveys from Canada and the United Kingdom were obtained on 97 males and 80 females with Down syndrome aged 5-60 years. Analysis revealed that self-talk was present in 91% of the survey sample and occurred less frequently when the person was alone. A person's age and level of disability did not influence their ability to engage in self talk. Observed self-talk was generally understandable and displayed in a normal tone. A person's self-talk was typically directed to themselves, but could also involve a real or imaginary person or a favourite toy/object. The content of self-talk focused on an event that recently occurred or was expected to occur, a television program or movie, family or friends, completion of an activity, or various complaints. Self-talk also served as an outlet for planning or rehearsing an activity, working out a problem, or as a self-dialogue about something interesting or important. Self-talk or talking out loud to oneself (also referred to as 'private speech') is a common behavior in young children and plays an important role in the development of higher-level thinking and self-directional skills. Developmentally, children engage in self-talk to coordinate their actions and thoughts. During focused goal-directed activities, self-talk/private speech systematically becomes more selective in 4-year-old children than in 3 year olds. By the age of 6 or 7 years, most children stop talking out loud to themselves and develop an internal dialogue when working out problems or challenging tasks. In certain situations, people engage in self-talk (either positive or negative) during periods of stress or conflict or to motivate themselves. Negative self-talk has been found to increase during levels of affective stress in children and adolescents with anxiety and depression[3,4]. Studies of the use of self-talk in people engaged in exercise and competitive sports have found that exercisers and athletes use self-talk as a positive, motivating behavior to enhance their performance[5,6,7]. Few studies have been conducted on self-talk behavior in people with intellectual disabilities. Self-talk has been a common observation by parents of children and adults with Down syndrome[8,9]. It was postulated that self-talk is an important aspect of the thought processes of people with Down syndrome when they are working out difficult situations, expressing feelings, and entertaining themselves. No association was found between self-talk/private speech and behavior problems, communication difficulties, or social isolation. However, self-talk in adults with Down syndrome has sometimes been incorrectly considered to be hallucinatory behavior [11,12]. A review of over 500 children and adults with Down syndrome (ages 11-83 years) seen in a wellness clinic in Chicago revealed that 81% engaged in conversations with themselves or with imaginary companions. It was speculated that they engaged in self-talk to vent feelings, to cope with or problem-solve a situation, to entertain themselves or to direct their behavior and make sense of frustrating or confusing situations. In some cases, it was found that the person's speech was clearer when talking to himself or herself than when carrying out a conversation with others. The reason for this may be that there is less social pressure when the person is speaking to himself or herself . In the United Kingdom, a formal study interviewed parents of young people with Down syndrome who were talking out loud to themselves . The study group comprised 77 people with Down syndrome ages 17 to 24 years. Findings indicated that 91% engaged in self-talk or had done so in the past as reported by their parents. Private speech involved talking to objects, self-dialogue, self-direction, describing an activity, and muttering. The presence or absence of self-talk was influenced by the mental age of the individual, and appeared to follow the expected developmental pattern. Self-talk was absent in persons with a calculated mental age below 37 months, while for persons with a mental age above 128 months, self-talk was not currently reported by their parents but had been an observed behavior in the past. The authors concluded that the presence of self-talk should be seen as an adaptive behavior rather than an indication of pathology. A study from South Australia found that 90% of 104 people with Down syndrome ages 8 to 35 years engaged in self-talk (as reported by their parents) . Most parents considered self-talk to be a useful tool for their child and were not overly concerned about the behavior. Self-talk took the form of a monologue, dialogue, commentary, entertainment-presentation, or role-playing outlet, and served as a method of self-regulation, debriefing oneself, decision-making, moral reasoning, fantasy/entertainment, and working through emotional problems . Thus far, reports and observations have indicated that many people with Down syndrome talk to themselves or engage in some type of fantasy that is similar to normal coping mechanisms of children. Some reports stressed that this behavior is not a hallucination or delusion[10,11]. If self-talk dramatically changes in its tone or frequency of occurrence, this change may signal a psychological problem such as depression, anxiety, physical pain, or some type of illness [10,14]. Self-talk and behavior rituals were found to be common behavioral features in adults with Down syndrome, and in most instances, were not a sign of a psychiatric disorder . In a cohort of 206 people with Down syndrome seen in a diagnostic clinic (mean age 47 years), 23% were reported by group home staff to engage in some type of self-talk behavior; however, only 5% were diagnosed with a psychotic disorder. In an earlier report on depression in people with Down syndrome, it was likely that some of the individuals thought to be responding to an internal dialogue classified as hallucinations were actually engaged in self-talk behavior . It was suggested that clinicians should observe the individual for any change in the quality or content of their self-talk, such as an increase or decrease in volume, or any expressions of fear or anger. It is these types of changes, rather than the mere presence of self-talk, that may indicate psychopathology [14,15]. Other than the two studies cited above [9,13], no other formal studies have investigated self-talk behavior in either people with Down syndrome or other intellectual disabilities. This paper presents the results of a family survey of children and adults with Down syndrome from Canada and the United Kingdom who engage in self-talk behavior and discusses the nature and function of this behavior. To examine the characteristics of self-talk behavior, an 18-item questionnaire was constructed. The Self-Talk Survey [see Appendix A] was one part of a two-part family survey developed for parents as the respondents. The aim of the Self-Talk Survey was twofold: (1) to determine the incidence of people with Down syndrome who talk to themselves, and (2) to evaluate the quality, style, and content of self-talk in those individuals. The three primary questions explored in the survey are: (1) Who do people who self-talk appear to be talking to? (2) Where and when does it typically occur? (3) What do self-talkers usually talk about? Approval from the authors' Institutional Review Board was obtained for the design and distribution of the Self-Talk Survey. The survey was distributed to families in Canada and the United Kingdom. The only inclusion criteria were that the individual have Down syndrome, be chronologically older than age 5 years, and possess some degree of expressive language. In Canada, a total of 297 surveys were mailed to parents and caregivers who were linked to the national registry of the Down Syndrome Research Foundation (DSRF) in Vancouver, British Columbia. 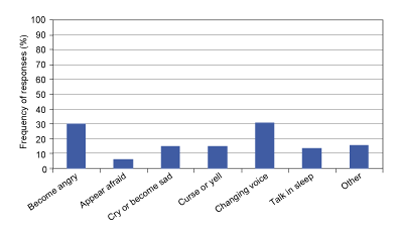 A total of 95 surveys were returned, resulting in a 32% response rate from the Canadian registry of the DSRF. An additional seven completed surveys were obtained from family care providers in Ontario not included in the registry. The majority of returned surveys came from the provinces of British Columbia and Ontario. The mean age of the individuals was 20.01 years (SD = 13.44) and ranged in age from 5 to 60 years (Figure 1). In the United Kingdom, a notice about the survey project was placed in the DS Scotland News, the quarterly newsletter of Down's Syndrome Scotland, and in the DSA Journal, the quarterly magazine of the Down's Syndrome Association (UK). A total of 79 families requested and returned a completed survey; four were excluded because of missing data or because the child surveyed was younger than 5 years of age. The majority of respondents were from counties throughout Scotland and England. The mean age of the individuals was 19.17 years (SD = 8.54) and ranged in age from 5 - 49 years (Figure 2). 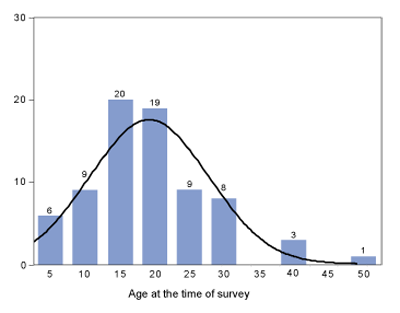 Ratings for each of the 18 items on the questionnaire were coded, and descriptive statistics were conducted using computerised statistical software . Data for each item was summarised and then converted into percentages. A series of logistical regressions were conducted on age, gender, and level of disability. The survey sample consisted of 177 individuals (97 males, 80 females) with Down syndrome. The level of disability for each individual was recorded on the background information sheet by respondents, and ranged from profound (2%), profound to severe (4%), severe (15%), moderate (50%), and mild (21%). For 15 individuals (8%), the level of disability was either missing or unknown. In almost all cases, the person being surveyed lived at home, and the respondent was a parent. A total of 162 individuals (91%) were reported to engage in self-talk behavior. Thirty-five respondents (20%) reported that the individual had self-talked in the past, while 13 (7.5%) reported that they did not self-talk in the past. The majority of the respondents (72%) moved on to the next item without answering this question (Question 2) since most currently self-talked. A preliminary analysis was conducted to test whether self-talk would be different in the Canadian and UK samples. A chi-square analysis revealed no significant difference between the two samples (χ2 [1, N = 174] = 3.25, p > .05), indicating that the country in which the person resides did not influence self-talk behavior. Questions that required a response of 'Yes', 'Sometimes' or 'No' are summarised in Table 1. The majority of parent respondents (75%) reported that their child's self-talk first began in childhood and that it has been persisting for many years (74%) with most ratings indicating that they did not stop talking to themselves for one or more months (71%). When asked if the child/adult self-talked only when alone, a combined 101 parents/carers (62%) responded 'No' or 'Sometimes'. The ratings on where self-talk usually occurs was re-coded on the basis of the more general categorisations of House, Public, or All Places. The data was equally divided and revealed self-talk to occur only in the home (45%) or in all places (45%). Only one parent indicated that their child self-talks only in public - specifically, while waiting for a taxi. Note: All percentages rounded to the nearest whole number. When asked if self-talk continues when someone sits near the person, a combined 101 parents/carers (62%) answered 'Yes' or 'Sometimes'. However, when approached by other people, 146 (90%) reported that the person would cease their self-talk. Parents/carers were also asked if self-talk is disturbing or disrupting to other people. A total of 101 (62%) checked that it is not disturbing. When asked if self-talk behavior affects the person's ability to focus at work or in school, 111 (68%) answered 'No'. Similarly, 98 (60%) reported that the person's self-talk does not affect their ability to interact with others. Ratings on the quality and volume of self-talk are summarised in Figure 3. Self-talk was 'mostly understandable' (51%) and spoken in a 'normal tone' (51%). This makes parent/carer ratings for the remaining survey questions about the content of self-talk more reliable, since they are able to accurately decipher the character and content of the child/adult's self-talk behavior. Figure 4 | Ratings specifying to whom individuals speak while self-talking. Note: N = 162, see Appendix for item details. The person(s) or object(s) to whom the person appears to be talking are summarised in Figure 4. More than half of the respondents (64%) indicated that the person's self-talk was directed to 'himself/herself'. Other responses included 'someone that they know' (32%), 'an imaginary person' (30%), 'favourite toys or objects' (25%), and/or 'a superhero, sports figure, TV/Movie character' (24%). When asked what the person usually talks about, parent/carer responses were more diverse. From the listed choices, the most frequently checked were 'an upcoming event' (53%), 'something that happened that day' (52%), 'favourite TV program or movie' (46%), 'completing an activity or action' (45%), 'familiar people' (38%), 'complaining about someone/something' (37%), and a 'traumatic or an upsetting event' (32%). 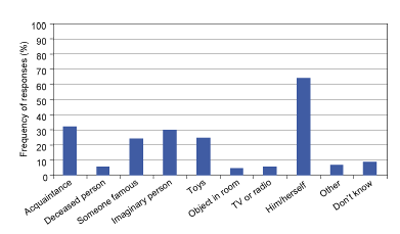 Additional responses were also checked but were much lower in frequency of occurrence (Figure 5). Parents/carers were asked to indicate if any additional behaviors occur during self-talk (Figure 6). From the listed choices, the most frequently identified were 'become angry or upset' (30%) and 'change their voice' as if to imitate another person (31%). Figure 5 | Ratings specifying what individuals talk about while self-talking. Note: N = 162, see Appendix for item details. To determine whether the presence of self-talk was predicted by age, level of disability, or gender, a series of logistic regressions were conducted for each factor (Table 2). 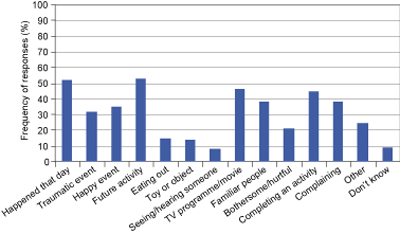 Prior to running the analysis, the age of each person was log-transformed to correct for the positive skew of the distribution (skewness = 1.42). Results revealed that none of the factors significantly predicted whether or not a person was described as a self-talker. Note: For all chi-squares: df = 3, N = 174. Age was log-transformed to resemble a normal distribution. The results revealed that 91% of 177 persons in the survey engaged in self-talk and that this behavior has been occurring for many years. This was consistent with past findings that a high percentage of children and adults with Down syndrome self-talk regardless of age. Although a selection bias may exist from the parents/carers who responded to the direct mailing or the newsletter notices the survey data provided two distinct samples of self-talkers to be studied. Over 70% of persons surveyed were in the moderate to mild level of disability, indicating a mental age well above 36 months. Although older adults (> age 30 years) represented 23% of the survey sample, age and the level of disability were not found to be factors in the individuals' ability to engage in self-talk behavior. "doesn't like to be asked what she is talking about; as far as she is concerned, it is a private conversation." "Self-talk is an outlet that allows her to say whatever she wants without someone interfering or challenging her. She self-talks to hear what she has learned, read or seen as a way of understanding it. We [parents] feel that this is a processing tool for her." "Perhaps he talks to his thumb because he can't get people to understand what he is saying." "He uses objects as a puppet and consults with it all day long; if nothing is available, he curves his fingers and uses his hand." The frequency of self-talk being directed to an imaginary person was somewhat less than expected. The present findings revealed 'talking to an imaginary person' was present in 30% of the survey sample, however, the frequency of self-talk directed to 'someone they know' was similar (32%), and was only slightly lower for a 'favourite toy or object' (25%) or 'someone famous' (24%), suggesting no clear preferred target for self-talk other than to oneself. The view that self-talk serves to assist in planning, rehearsing, debriefing and self-calming was supported by the present results. More than half of respondents reported that self-talk involved upcoming or recent events in the person's daily life. In some instances, self-talk specifically involved happy or traumatic events. A favourite movie or television program as the focus of self-talk had the third highest incidence. It is speculated that some self-talkers develop a close bond with a movie or television character and confide in that 'person' during their self-talk. Some self-talk also involved complaints about someone or something. Almost 33% of parents/carers reported that the person might become angry or upset during self-talk and, in some instances, imitate another's voice as a means of directing oneself to deal with a particular problem or event. One parent indicated that their son talks non-stop when he is stressed. Another parent indicated that her son "talks himself down at the end of the day." From the ratings, there was little to suggest any indications of psychotic or psychiatric disturbance. Seeing or hearing someone in the room (indicative of hallucinatory behavior) was reported by only a few respondents. Indications are that most respondents viewed self-talk as a positive behavior and not a cause of concern. It has been the opinion of McGuire and Chicoine, and others that it is best not to stop or discourage self-talk behavior, but rather to make it more socially acceptable. If self-talk is disruptive or disturbing, it may be necessary to discuss with the person appropriate locations for their self-talk. The quality, style, and content of self-talk expressed can provide some insight as to what they are thinking and indicate if something or someone is troubling them. It is also important to determine if the child/adult actually sees their imaginary friend and believes that this person is really there. Additionally, changes in the frequency, location, or volume of self-talk, as well as self-talk that results in agitation, fear, or sadness should be investigated since this may represent an underlying physical or psychological problem that needs to be addressed. Further studies are necessary to explore any differences in the manner and content of self-talk behavior among children, adolescents, and adults with Down syndrome. Does self-talk in children and adolescents involve more toys, objects, imaginary friends, and television/movie characters compared to adults in whom self-talk may focus more on social or relationship issues? Another factor to consider is that many older adults with Down syndrome live outside of the family home (i.e., group homes, supportive living settings), resulting in potentially more social issues, challenges, and conflicts, which may maintain the need for self-talk as a self-guide to work through problems or life issues as they arise. To date, studies on the incidence of self-talk in people with other intellectual disabilities have not been reported. The authors are currently distributing the Self-Talk Survey to parents of children and adults with autism, fragile X syndrome, and other intellectual/learning disabilities to investigate if there are any qualitative differences from the present findings. Winsler A, Carlton MP, Barry MJ. Age-related changes in preschool children's systematic use of private speech in a natural setting. Journal of Child Language. 2000;27:665-687. Kohlberg L, Yaeger J, Hjertholm E. Private speech: four studies and a review of theories. Child Development. 1968;39:781-736. Ronan KR, Kendall PC. Self-talk in distressed youth: states-of-mind and content specificity. Journal of Clinical Child Psychology. 1997;26(4):330-337. Lodge J, Harte DK, Tripp G. Children's self-talk under conditions of mild anxiety. Journal of Anxiety Disorders. 1998;12(2):153-176. Gammage K, Hardy J, Hall CR. A description of self-talk in exercise. Psychology of Sport and Exercise. 2001;2:233-247. Hardy J, Hall CR, Alexander MR. Exploring self-talk and affective states in sport. Journal of Sports Science. 2001;19(7):469-475. Hardy J, Hall CR, Hardy L. Quantifying athlete self-talk. Journal of Sports Science. 2005;23(9):905-917. McGuire D, Chicoine B, Greenbaum E. Self-talk in adults with Down syndrome. Disability Solutions. 1997;2(1):1-4. Glenn SM, Cunningham CC. Parents' reports of young people with Down syndrome talking out loud to themselves. Mental Retardation. 2000;38(6):498-505. McGuire D, Chicoine B. Self-talk, imaginary friends, and fantasy life. In: Mental Wellness in Adults with Down Syndrome: A Guide to Emotional and Behavioral Strengths and Challenges. Woodbine House, Inc; 2006. p.136-146. Hurley AD. The misdiagnosis of hallucinations and delusions in persons with mental retardation: A neurodevelopmental perspective. Seminars in Clinical Neuropsychiatry. 1996;1(2):122-133. McGuire D, Chicoine B. Depressive disorders in adults with Down syndrome. Habilitative Mental Healthcare Newsletter. 1996;15(1):26-27. Opolski J. 'Still talking...': Continuing the investigation of self-talk of people with Down syndrome. Down Syndrome Quarterly (Special World Congress Edition). 2006:8;79. McGuire D, Chicoine B. Life issues of adolescents and adults with Down syndrome. In: Cohen W, Nadel L and Madnick M, editors. Down Syndrome: Visions for the 21st Century. New York: Wiley-Liss; 2002. p. 221-236. Patti PJ, Tsiouris J. Emotional and behavioral disturbances in adults with Down syndrome. In: Davidson, P, Prasher, V and Janicki, M, editors. Mental Health, Intellectual Disabilities and the Aging Process. London: Blackwell; 2003. p. 81-93. Myers B, Pueschel S. Major depression in a small group of adults with Down syndrome. Research in Developmental Disabilities. 1995:16;285-299. Statistical Package for the Social Sciences-11.5.1. SPSS, Chicago, IL; 2002. This research was supported in part by funds from the Research Foundation for Mental Hygiene (Project Number 1002416). The authors wish to thank Anne Eichmann and the Down Syndrome Research Foundation in Burnaby, British Columbia, for distributing our survey in Canada. In the United Kingdom, we wish to thank Dr. Heather Wilkinson and Fiona Anderson from the Center for Research on Families and Relationships, University of Edinburgh; and Down's Syndrome Scotland, and the Down's Syndrome Association (UK) for all their assistance in obtaining the completed surveys in the UK. We also wish to thank all the parents who kindly completed the Self-Talk Survey and provided us with information about their child's self-talk behavior. Finally, we wish to thank Dr. Amy K. Eshleman for her assistance with data analysis. Paul J. Patti, primary author, coordinated the collection of all data and completed the writing of this manuscript. Nancy Andiloro performed the data analysis and constructed the table and figures in this manuscript. Maureen Gavin assisted in obtaining the completed surveys and in the writing of this manuscript. There are no competing interests associated with any of the contributing authors. Does the person currently engage in self-talk (talking out loud to himself or herself)? If the person does not talk out loud to himself or herself now, did they ever do this in the past? (If you answered No or Don't Know to question 1 and 2, skip the rest of this survey! When did the person first begin to self-talk? How long have you observed the person talking to himself or herself? Do they self-talk only when they are alone? When other people are sitting near them, do they continue to self-talk? When approached by other people, do they stop talking to themselves? Have they ever stopped talking to themselves for one or more months? Is the person's self-talk disturbing or disrupting to other people? Does the person's self-talk affect their ability to focus and concentrate at work or in school? Does the person's self-talk affect their ability to interact with or relate to other people? Thank-you, your responses will help us to better understand people who self-talk.